Have you ever thought about how nutrition affects your eyes? Many people neglect to think about them as much as they think about losing that excess weight or achieving other health goals. There are two nutrients in particular that may act as a natural shield that can protect our eyes from the sun’s harmful rays and a number of eye issues – lutein and zeaxanthin. Even if your vision is 20/20 or better in your youth, there are certain parts of aging that make it difficult to maintain excellent vision; and most people start struggling with focusing after the age of 40 due to a gradual hardening of the lens inside the eye called presbyopia. This condition tends to advance as we age and the lens of the eye is no longer as flexible to adjust and accommodate to various distances of sight (focal lengths). Do you need one pair of glasses for most tasks, but another pair for intermediate ranges such as working on a computer or reading a book? This is often the first sign of the onset of presbyopia. Are you reading this article on a smartphone? Between the extra small text displayed on smartphones and the fact that people hold their smartphones closer than they hold a book or magazine, presbyopia is becoming more common and is being diagnosed at earlier ages. There are other conditions that, while also considered age-related, fit more into the category of eye disease than presbyopia does. One example is cataracts. Cataracts are the clouding of the normally clear lens of the eye that causes blurry vision. Cataracts develop slowly over time and the Mayo Clinic estimates that about half of Americans have some degree of cataract formation by the time they reach 65. Age-related macular degeneration (AMD) is another example and is even more serious. Although the causes of AMD are not fully understood, AMD is a debilitating condition that results in wavy, then blurred, and finally a total loss of vision in the center of the visual field. It occurs when the cells in the back of the eye that capture the light begin to deteriorate. According to the National Eye Institute, AMD is the leading cause of blindness in American seniors. There are a couple different forms of macular degeneration; one of which is primarily genetic and the other is linked to the environment, smoking, race, and diet. Fortunately, studies show that lutein and zeaxanthin are highly effective in helping to prevent and reduce the symptoms associated with these eye disorders. Lutein and zeaxanthin are carotenoids that naturally provide yellow and red coloring to vegetables and other plants. But the purpose of lutein and zeaxanthin is not just to give plants color; they protect them from excess light damage that can occur when they get too much sunlight. Lutein and zeaxanthin are powerful antioxidants, much like vitamin C or beta carotene, which are important for preventing the oxidation of molecules in the body that leads to damaged DNA, proteins, and cell membranes. Lutein and zeaxanthin are found in the eye’s macula, the sensitive part of the central retina that is responsible for visual clarity and seeing color. Just like with plants, they play a contributing role in protecting the eyes from harmful ultraviolet light from the sun. How can lutein and zeaxanthin help? Supplementing with lutein and zeaxanthin can help relieve some of the common symptoms of presbyopia. For instance, some people with presbyopia struggle with contrast sensitivity. Contrast sensitivity is a measure of visual function when the contrast between objects and their background is reduced (such as in situations of low light, fog or glare). Those with subpar contrast sensitivity may get tired eyes when reading or watching television, and may struggle with night driving. This symptom can also make it harder to use computers, but a Chinese study published in The British Journal of Nutrition found that long-term computer users who supplemented with 12 mg a day of lutein saw significant improvements in contrast sensitivity. Another study, published in Applied Ergonomics, confirmed that an oral supplement containing lutein and zeaxanthin is capable of reliving the visual fatigue commonly associated with presbyopia. As common and problematic as presbyopia is, the most exciting thing about lutein and zeaxanthin is their ability to address even more serious eye conditions like cataracts and AMD. A study published in Archives of Ophthalmology found that diets rich in lutein and zeaxanthin are associated with a decreased risk of cataracts. Although the researchers note that eating the kind of healthy diet that includes lutein and zeaxanthin would likely give you other nutrients that help keep the eyes healthy, the study looked at women aged 50-79 and found that those with high intake of lutein and zeaxanthin had a 23% lower prevalence of cataracts. The American Optometric Association also recommends lutein and zeaxanthin for cataract prevention because of their roles as antioxidants that keep the lens of the eyes clear. Many people opt for surgery to address cataracts, but a review from Nutrition Reviews notes that not everyone has access to cataract surgery (and there are many more who would simply not want it) and supplementing with lutein, zeaxanthin, and B vitamins is effective as a preventative measure. You may inevitably need surgery if you already suffer from a cataract, but those who do not yet can improve their chances of keeping a clear, cataract-free eye lens (and avoiding surgery) by getting sufficient levels of antioxidants like lutein and zeaxanthin. Age-related macular degeneration appears to be the most serious eye condition that lutein and zeaxanthin can help with, and there is strong scientific evidence demonstrating its effectiveness. A long-term, comprehensive study from The Journal of the American Medical Association: Ophthalmology concluded that a high intake of well-absorbed lutein and zeaxanthin is associated with a long-term reduced risk of advanced AMD. The study followed over 100,000 men and women over 50 for multiple decades and found those with high levels of lutein and zeaxanthin reduced their risk of advanced AMD by 40%. These findings are consistent with other studies, such as one published in Investigative Ophthalmology and Visual Science that found eyes with higher levels of macular pigment (which is primarily composed of lutein and zeaxanthin) are less likely to develop AMD. Another study, from The Journal of Clinical & Experimental Ophthalmology, found that those with early AMD who consume lutein and zeaxanthin daily improved their night driving and the sharpness of their vision. In fact, those taking zeaxanthin for one year improved their high-contrast visual acuity by about one and a half lines on an eye chart on average, according to a study published in Optometry. Unfortunately, the body cannot produce its own lutein and zeaxanthin. But since they give green and yellow vegetables their colors, it makes sense that these would be the best dietary source. Spinach, corn, green peas, and kale are some of the most common examples of foods containing lutein and zeaxanthin. There is no official recommended daily intake of these important antioxidants, but most studies show significant benefit in getting at least 10 mg of lutein and 2 mg of zeaxanthin each day, according to the American Optometric Association. Most people fall short of this mark either because they don’t eat the kinds of green and yellow vegetables that contain lutein and zeaxanthin, or they simply don’t eat enough. You would have to consume approximately 1 cup each of raw spinach, corn, green peas, and broccoli each day to get the proper amount to maintain good eye health. This is why supplementation is appealing to many people. In addition to getting your eyes the nutrients they need, be sure to protect them with quality, polarized sunglasses that screen 99-100% of ultraviolet A and B rays. 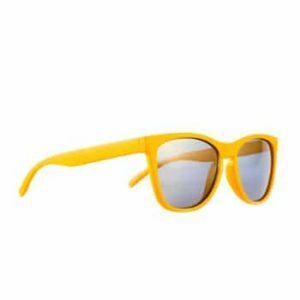 There are even sunglasses designed specifically for macular degeneration that utilize side panels and a ridge at the top of the glasses to filter out all light. For those just looking to get the right amount of lutein and zeaxanthin to preserve good eye health, Pure Encapsulations’ Lutein/Zeaxanthin provides the right amount to meet your daily needs. 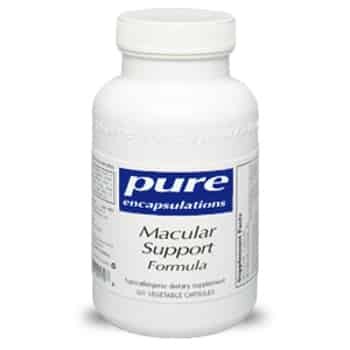 If you would like to go a step further, I would consider looking at Macular Support Formula. It contains the same amount of lutein and zeaxanthin, but also features a complex of other potent eye health nutrients such as vitamins A and C, bilberry and grape seed extracts, and lycopene. Studies have also shown that Omega-3 fatty acids (fish oil) are also important for eye care. This combination provides protection from harmful oxidants that can accumulate in retinal tissues and maintains the health of the optical lens. I hope this information helps to clarify what you can do to support your eyes for the rest of your life and encourages you to keep learning more about visual health. If you have any questions regarding the concepts discussed here or anything else, you can reach our customer service team at 888-460-3091 or e-mail them at customerservice@oakwaynaturals.com. There are two nutrients in particular that act as a natural shield that can protect our eyes from the sun’s harmful rays and the risk of macular degeneration, cataracts, and other eye issues – lutein and zeaxanthin. Most people start struggling with focusing after the age of 40 due to a gradual hardening of the lens inside the eye called presbyopia. This condition tends to advance as we age and the lens of the eye is no longer as flexible to adjust and accommodate to various distances of sight (focal lengths). There are other conditions that, while also considered age-related, fit more into the category of eye disease than presbyopia does. Cataracts are the clouding of the normally clear lens of the eye that causes blurry vision. Cataracts develop slowly over time and the Mayo Clinic estimates that about half of Americans have some degree of cataract formation by the time they reach 65. Age-related macular degeneration (AMD) is another example and is even more serious. AMD is a debilitating condition that results in wavy, then blurred, and finally a total loss of vision in the center of the visual field. According to the National Eye Institute, AMD is the leading cause of blindness in American seniors. Fortunately, studies show that lutein and zeaxanthin are highly effective in helping to prevent and reduce the symptoms associated with these eye disorders. Those with subpar contrast sensitivity may get tired eyes when reading or watching television, and may struggle with night driving. This symptom can also make it harder to use computers, but one study found that long-term computer users who supplemented with 12 mg a day of lutein saw significant improvements in contrast sensitivity. Age-related macular degeneration appears to be the most serious eye condition that lutein and zeaxanthin can help with, and there is a robust amount of scientific evidence demonstrating its effectiveness. A long-term, comprehensive study from The Journal of the American Medical Association: Ophthalmology concluded that a high intake of well-absorbed lutein and zeaxanthin is associated with a long-term reduced risk of advanced AMD. Another study, found that those with early AMD who consume lutein and zeaxanthin daily improved their night driving and the sharpness of their vision. You would have to consume approximately 1 cup each of raw spinach, corn, green peas, and broccoli each day to get the proper amount to maintain good eye health.